The snake is shown curled three times around the neck of the Lord and is looking towards His right side. The three coils of the snake symbolize the past, present and future - time in cycles. 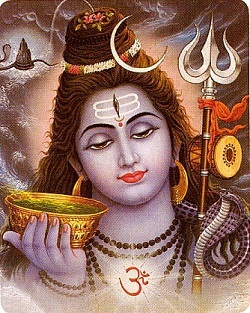 Rudra is another name of Shiva. Rudraksha necklace worn by the Lord illustrates that He uses His cosmic laws firmly - without compromise - to maintain law and order in the universe. 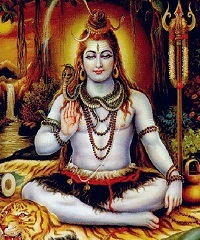 Lord Shiva's right hand is shown in a boon- bestowing and blessing pose, which annihilates evil, grants boons, bestows grace, destroys ignorance, and awakens wisdom in His devotees. A three-pronged trident shown adjacent to the Lord symbolizes His three fundamental powers (shakti) of will (iccha), action (kriya) and knowledge (jnana). Damaru (drum): Damaru symbolizes the two utterly dissimilar states of existence, unmanifest and manifest. The unclad body of Lord Shiva covered the ashes signify that Shiva is the source of the entire universe which emanates from Him, but He transcends the physical phenomena and is not affected by it.